Department of Education and Early Development Commissioner Dr. Michael Johnson was in front of the Senate Finance Committee on Wednesday to be interviewed for the job of successor for the lieutenant governor. The roughly 45-minute interview ranged from exploring his broad political philosophy to his support for Gov. Michael J. Dunleavy’s proposal to cut $20 million out of the current school year’s budget (he does, but hadn’t consulted with schools) as well as the roles of the lieutenant governor like defending the Alaska State Seal and overseeing elections. 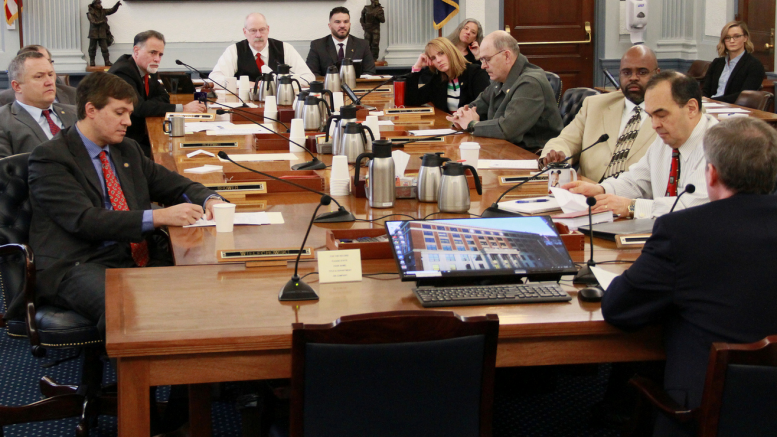 It was a generally genial meeting between senators and the commissioner, who was appointed to the head of the Department of Education by the Alaska Board of Education in 2016, but turned a little more tense when Sen. Bill Wielechowski, D-Anchorage, asked about his position on school vouchers, one of the few legislative priorities proposed by Sen. Mike Dunleavy during his time in the Senate. “Do you believe the constitution should be changed to allow public funds for private or religious schools?” Wielechowski asked. Legislators can propose amendments to the Alaska Constitution through joint resolutions, as Dunleavy did in 2013 with Senate Joint Resolution 9, that require a two-thirds vote of each body (27 in the House and 14 in the Senate) for the amendment to go to a public vote. His statement that the constitution shouldn’t be changed without a vote of the people is already how the process works. The Alaska Constitution explicitly bars public money from going to private or religious schools, though parents can receive state funds for home-school programs administered by local school districts. Johnson’s answer—essentially an explanation of the existing amendment process—was not enough for Wielechwoski, who pointed out that governors and lieutenant governors are vetted through the public process and a lieutenant governor gets to oversee elections and the certification of initiatives. “You could be in a position where you could certify something like that or you could potentially be governor, and I’m just curious what your position is as the education commissioner would that be a good thing for our state?” he asked. That statement, that he agrees with the Alaska Constitution’s prohibition on public money going to religious schools, was the closest he came to stating any apprehension when it comes to school vouchers, but his following statement seemed to roll that back a bit. Dunleavy’s SJR 9 would have permitted public funding to go to both private or religious schools though he frequently deflected what precise shape a voucher program would take. Repeal the prohibition first, then figure out the details, he argued. That was the end of Wielechowski’s line of questioning, but Sen. Click Bishop, R-Fairbanks, continued the discussion to say that he hoped anyone pushing a constitutional amendment should pay careful consideration to how it would impact the public education system. Johnson agreed with Bishop’s assessment of the program. “I wouldn’t support anything that would be harmful to the free and appropriate education public education that we provide to the students of the state,” he said. It just so turns out that some work has already been done to understand the impact of extending public funding to students attending Alaska’s religious and private schools. In 2014, shortly before Dunleavy’s SJR9 came to its humiliating demise—pulled from a floor vote when it was clear it wouldn’t pass—there was a legislative research report on this very subject. The report, which can be found here, made several assumptions because the state doesn’t track private school enrollment and because Dunleavy never offered a clear vision of what an Alaska school vouchers system would look like, but it estimated it’d inflate the school funding budget of the 2014 fiscal year by nearly $100 million. It was built on the assumption that the roughly 11,000 students in Alaska who were enrolled in private or religious programs would receive the full school funding made available to school districts through the base student formula—which was $5,680 at the time—costing the state $99.7 million. The base student allocation funding formula was increased to $5,930 for the 2017 fiscal year and has remained there. The Legislature never got a particularly clear picture about the efficacy of voucher programs, either, as it turned out that it was largely based on the stringency of the state regulations placed on the private or religious programs. Be the first to comment on "Education Commissioner Johnson refuses to take a position on school vouchers"